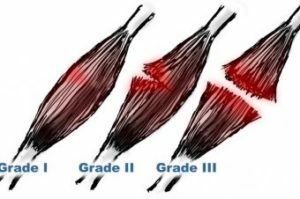 — What Are The Grades Of Tendon Tears? After experiencing numerous ankle sprains for years while playing sport, you find that your most recent injury has resulted in a longer recovery time. This has led to multiple weeks off playing the sport you love. By spraining your ankle it causes the surrounding ligaments to be pulled into a stretched or torn position. Once this occurs, adequate rehabilitation is required in order to retain and strengthen the soft tissues surrounding the ankle. Without proper rehabilitation, repeated ankle sprains may occur. As a result of repeated ankle sprains, chronic ankle instability occurs due to continuous stretching of the tendons. Grade 2 (Moderate): The muscle/ tendon has been overstretched and slightly torn, moderate tenderness and swelling with bruising occurs, some functional loss (pain when weight-bearing) and there is mild to moderate instability. Grade 3 (Severe): The muscle/ tendon is partially/ completely ruptured (torn), severe swelling with bruising occurs, complete functional loss occurs (unable to weight bear) and there is moderate to severe instability. Depending on the severity of the tendon tear and certain risk factors such as previous injury, foot type, footwear and, sensory deficits such as; proprioception, muscle strength and postural stability, will all contribute to the type of treatment that is recommended. In order to prevent recurrent ankle sprains and tendon sprains and tears, proper rehabilitation will assist in reducing your risk of ongoing injuries. If you have been experiencing ongoing ankle sprains or persistent pain surrounding your ankle it’s time to book in to see one of our friendly podiatrists today for an assessment.